GULP…I didn’t even have $60 with me. So I told her I was going to look him up to see who he was. She thought that he was just a “sidewalk artist” of no repute, but when she saw me scrolling through things on my phone she got intrigued and asked when I was finding. She peered over my shoulder at the listings on my phone. “Maybe I should charge $200 for this,” she said. I took a deep breath and asked what she was going to charge for it. She thought a few seconds and said I could have it for $60 as she originally quoted. “Super. I’ll buy it for that, but I’ll need to get more cash.” I nipped back home, borrowed cash from my dubious husband and sped back before she changed her mind. 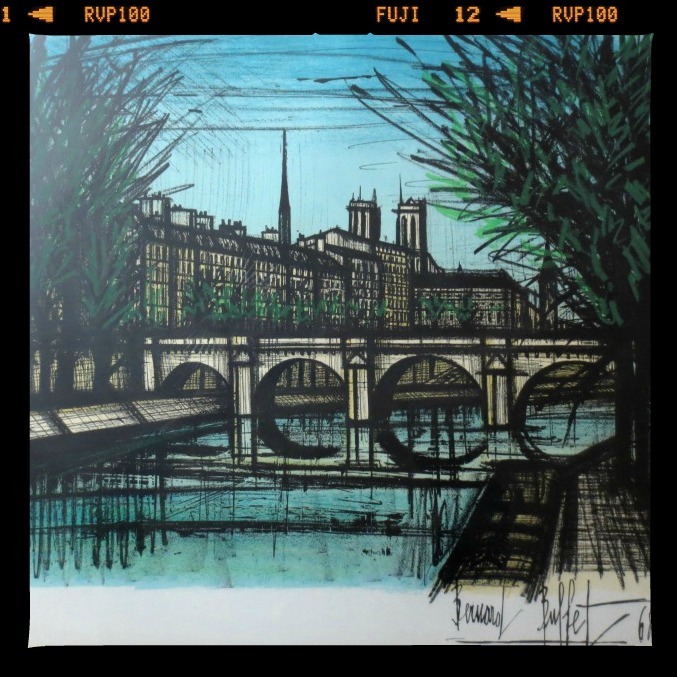 It’s actually a stone signed lithograph of the Pont de Neuf bridge in Paris (you can see Notre Dame in the background). Prices for Buffet’s work vary, but I should do alright on this. 1stdibs.com has the same one listed for $1,200, but I think they’re dreaming. 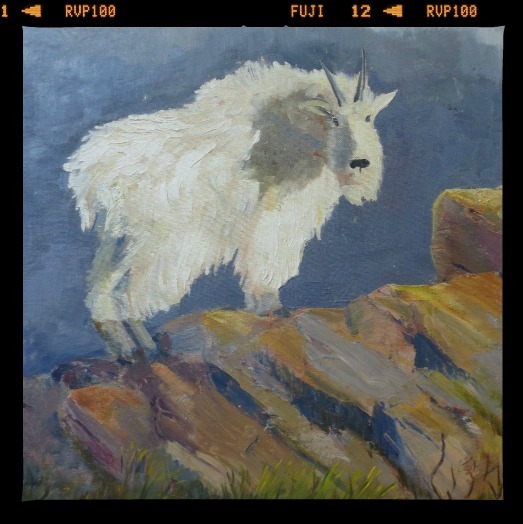 The nice mountain goat painting I bought at Goodwill just sold to a women in Montana…which seems like a great place for this 1959 painting by F.G. Houston! I made a nice profit and I think she got a great painting for $139. Huh??? Does he think I’m a rube? How is that any of his business or even relevant? Nor is it relevant that he wants to buy it as a gift for someone or that he bought a similar painting for $100. 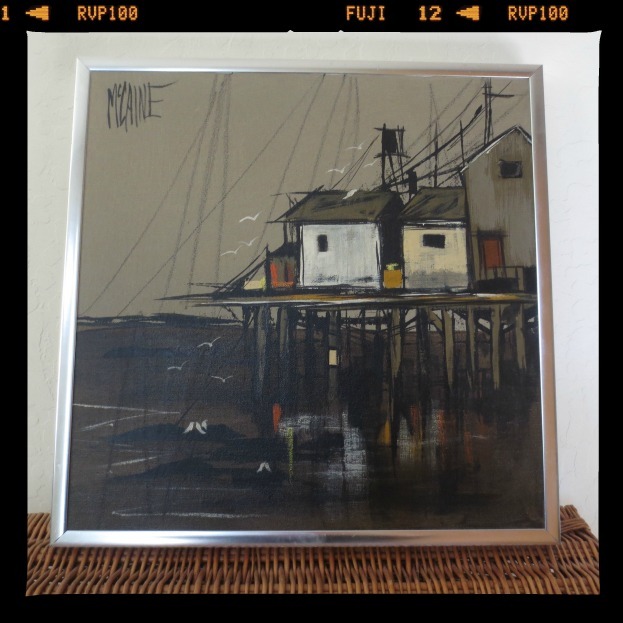 I think my price is a fair one for this artist’s work and for this particular painting. (I did the research. I didn’t just pull a number out of a hat!) I responded giving him a 10% off coupon code as my best offer. I’m guessing he won’t go for that price, which is okay by me. I adore my McCaine painting. I’m happy to keep this till the right person comes along.